My four year old is turning 5 and he made me one proud Dad. I asked him what he wanted for his birthday and he proudly said a Wakeboard. 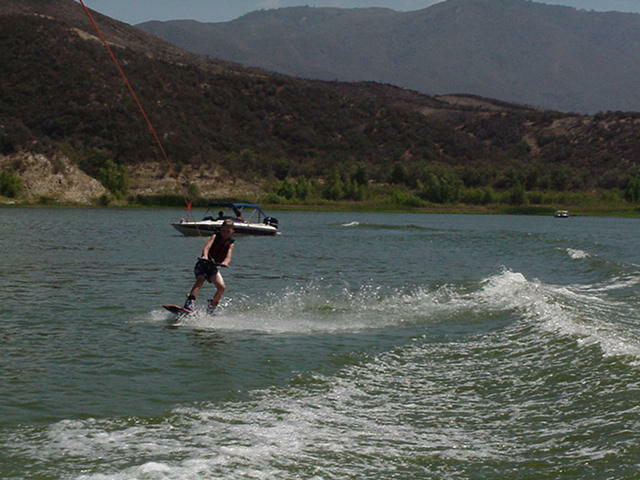 Well dad is a skier who dabbles in wakeboarding so I have no idea what to get him if any. His 6 year old brother is on training ski's and i am sure he will use it as well. They are both small they weigh about 45 pounds and stand about 43 inches tall. any advice on what to but and where to get one would be extremely helpful. i have looked at the usual web sites but the offer no direction on whats size to purchase for young children. You can get boards down as small as 118-121cm. I picked up an obrien myth 121 for my 7yo. He has warn it, and eager to ride it, but still a bit cold. I got a Motive 119 for my son. He was 8 when he learned on it and will be able to use it until he gets to be over 100 lbs. I'm going to get a Mini pair of binding and try to get my 5 yr. old daughter up on our houseboat trip next month. This site on ebay has some good tips on sizing for snowboards and wakeboards. Cool! The Hyperlite Motive 119 is a great board for kids that size. My son was a little older when he started so we got him an Era 124 (same as the old Premier, it's actually a 127 now which would be too big for your little guy). Another couple of good ones is a Liquid Force 122 Mini-Squirt & the Hyperlite Voyager 121. Check www.wileyski.com or www.grizzly-sports.com for leftovers, they often times have previous year & blem models. Most of the boards in that size range are going to be fine for beginner through intermediate levels, so most likely it will come down to which one he thinks is the coolest. My 90 lb. 10 year old uses a the Hyperlite Motive 128, so a slightly smaller board is called for in the case of your 5 year old. Seems to be very solid and kids feel confident quickly. Thanks everyone..sounds like the motive 119 is the way to go. Do you recomend pulling them from the pylon or the tower? My son rides a 119 motive as well. Great kids board. I tow him from the tower and about 13 -15 mph. He has been up to 18, but he gets scared and won't attack the wake. 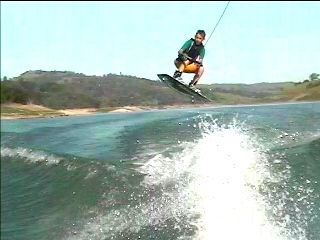 At 13 mph he crashes the wake like a mini pro. LF Nemesis 118 with Element bindings. This has been a great set-up for the little ones. I tow them from the tower. The 5 year old comes up almost at idle. Tower - it adds a little "lift" to help them out of the water, rather than being pulled forward only. My son rode a 128 when he started riding at 9 yo... now he's 14. I bought a Hyperlite Kids Unite Motive 121 for my daughter, but she never rode it. It's new (a blem board) with Liquid Force Medium Super Suctions on it if you're interested. Pic of my son at 9 or 10 yo. A pic of my daughter's board. Ditto that, plus since it's something that he'll need to get used to anyway it's a good idea.